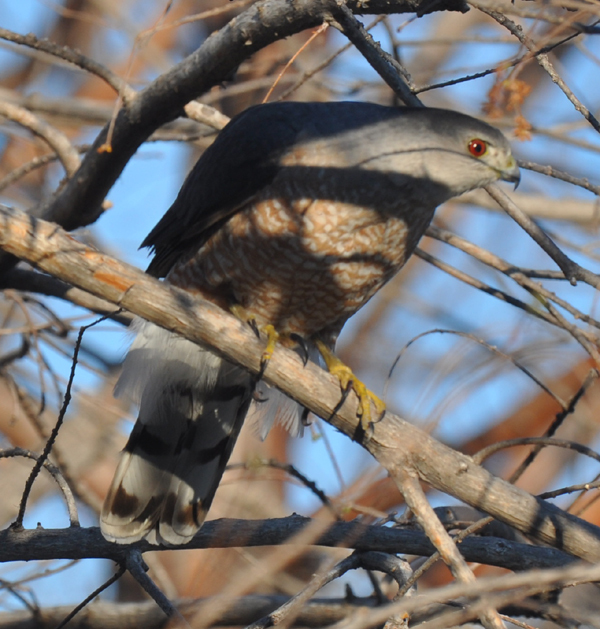 Although the Cooper’s hawk lives in silent solitude most of the year, he makes himself known during the breeding season. As soon as the approximate nest location is selected, either male or female will announce their intentions with a rapid nasal “kek-kek-kek-kek” as they fly to or near the site. 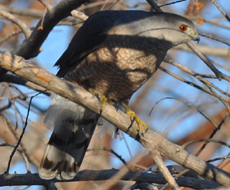 This is the primary vocalization and the one that is most easily recognized to identify the Cooper’s hawk. Variations of this call are used as contact calls and alarm calls. When the male is bringing food to the female or provisioning the nest, he announces his arrival at a nearby station – usually the plucking post – with a single “kek" or "kik” call. The female uses a "whaaa" call as she waits for or retrieves food the male has brought to the delivery point. While the nest is under construction and the pair is still mating, they begin their day with a “sunrise chorus,” harmonizing their repertoire of calls. When the “dawn duet” ends, they usually fly to the female’s perch and mate. There is also a variation of the "whaaa" call ("whaaa-eee") that the female begins and the male joins immediately before and during mating. The dawn duets cease soon after egg-laying begins. Meng (1957) attributes the female with as many as 40 different vocalizations; the male with around half that many. As soon as the young hawks venture out of the nest and onto branches in their nest tree, they begin to call to their parents for food. The call is a whistling “eee-eew eee-eew” sound. The fledglings will continue to beg in this manner for weeks, until either the parents leave them or they realize they must be quiet to hunt successfully on their own.